We are excited to present a new stationery line to our clients! We have decided to partner with Simply Personal because we love the level of customization they offer. We can also provide chair signs, seating charts, favor tags and more! Schedule an appointment to view the collection at our office. Welcome to part 2 of the Green Wedding Series! Look for companies that do not provide an inner envelope. It's very pretty, and I love the concept, but it does add up to a lot of extra paper. Also ask about invitation styles printed on recycled or tree-free papers. 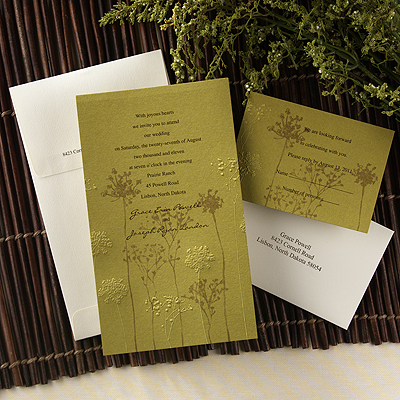 The invitation pictured above is from the Naturally Ever After line from Carlson Craft. Some companies offer papers that have wildflower seeds embedded. Your guests can bury your invitation in their yard and get a beautiful batch of flowers! Vegetable- or soy-based inks are less harmful to the environment that petroleum-based inks. Ask your printer if they offer this option. Use a local printer whenever possible; be sure to ask if they will print them in-house or send them out! Create a wedding website. List all of your accommodations, travel info, local attractions, etc. online instead of mailing packets to your out-of-town guests. Check out sites like Glö or Wedding Window for email invitations, save-the-dates, and RSVPs. Remember that not all your guests may be as tech-savvy as you are. Be sure to communicate all the necessary information by phone or handwritten note to anyone without email or internet access. I was exploring Paper-Source.com today, looking for some fun new papers to use around the office in 2009. To my surprise, I came across a project that fills a need I have been dealing with for a long time: organizing paper in my purse. I am constantly finding a stack of paper in the bottom of my purse - business cards that I get at networking events, business and personal receipts, and ideas I write down while driving. I have been looking for something to corral all that paper without adding even more weight to my already hefty handbag, and I think this is just the thing! As a wedding-related use, imagine how cute this would be to send to your out-of-town guests! Pockets could be labeled accommodations, attractions, restaurants, events, maps - or, if you are planning an entire wedding weekend, each day could have a pocket with that day's itinerary, dress code, etc. For complete project instructions, visit the Paper-Source.com website. Yesterday, I had the pleasure of meeting Darcy Sang of Pearl Beach Paperie. For anyone in the market for unique stationery, this is the place! Darcy is based in Central Florida but works statewide - in fact, two lines that she carries are only available from her. Pearl Beach carries a variety of letterpress, offset, digital and thermography options. Letterpress is so popular right now, but definitely not for the budget conscious. Darcy estimates that an average price for 100 letterpress invitations is around $900. Offset printing for 100 invitations can average $600, while standard thermography can be closer to $200-$300. "At home" cards are an often-overlooked tradition, but they can be extremely useful to your guests! Not only does the card inform your friends and family of your new address, but it also specifies the name you have chosen to use. As more and more brides chose to keep their maiden name or hyphenate their husband's name, wedding guests can be confused as to how to address the newly married couple. Traditionally, at-home cards are mailed with the formal wedding invitation, however they can be mailed separately the week of the wedding, or after the wedding. These cards should be ordered at the same time your wedding invitations are ordered. If you want to share a great map with your wedding guests, be sure to visit Wedding Mapper! You can create a free interactive map that includes the ceremony and reception sites, plus hotels, airports, attractions, restaurants and more! You can even upgrade to a map with no ads, a personal web address, and additional links (such as your registry information) for a one-time fee of $9.95. As an added bonus, Wedding Mapper has partnered with Distinctive Directions to give you 10% off when you turn your online map into a printed version. The graphic they create can be used for programs, map/direction cards in invitations, welcome basket letters, and more!